I seem to get tons of database errors today. Tested on two computer systems and two interweb connections. I had a heck of a time getting on here also. My user name and password woundnt take. They gave me my user name back, but had to make up a new password. Im scared to log off now, I may never get back here. this was also happening to me this morning, and slow as molasses! I thought it was just at my end (ISP). But I guess not. Seems to be working fine now. I had the same issue Red . I think we all had some "database errors". If you know how these forums work, you will understand that each forum is a big collection of database entries. 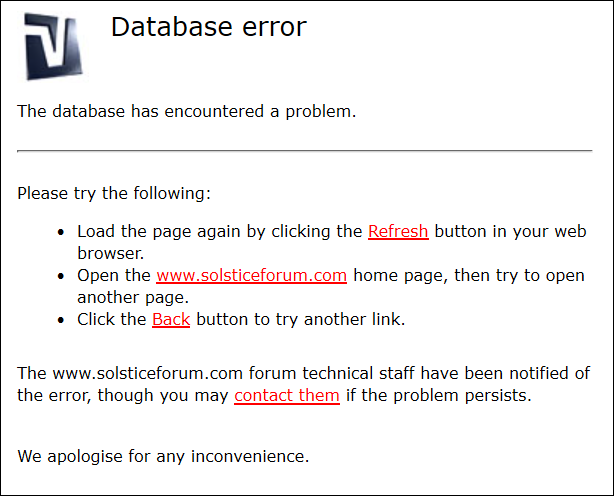 What pulls it all together is the indices, and I suspect there were some index issues at Solsticeforum. They were in the process of rebuilding the indices when these database errors were occurring. It happens every so often. Hopefully everything that needed attention got rebuilt. That's just my guess as to what happened. That should resolve your account from being logged out.